The current solar cycle has been relatively weak. The coming solar cycle is expected to be weak also, but not significantly weaker than the current cycle. Graph via NOAA’s Space Weather Prediction Center. 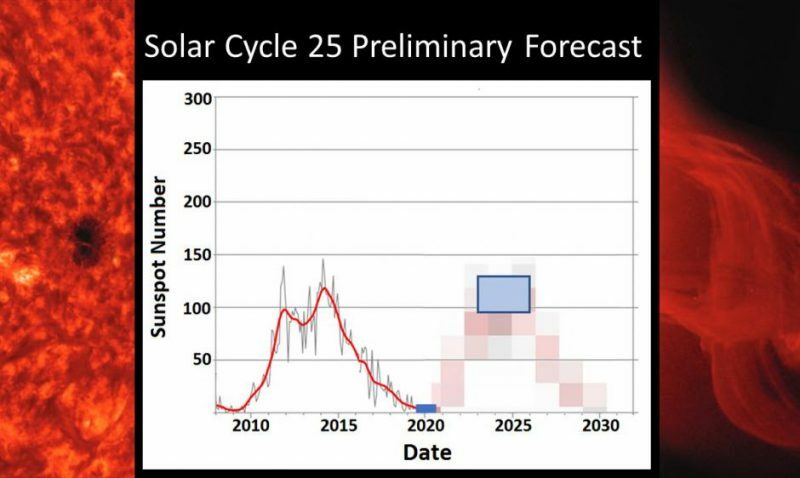 A NOAA/NASA co-chaired international panel – charged with forecasting the upcoming 11-year solar cycle, Solar Cycle 25 – released a preliminary forecast on April 5, 2019. … high confidence that the coming cycle should break the trend of weakening solar activity seen over the past four cycles. … the Thames River in England froze over during winter, Viking settlers abandoned Greenland, and Norwegian farmers demanded that the Danish king recompense them for lands occupied by advancing glaciers. No one understands exactly how or even if reduced sunspots cause cooler weather on Earth, but speculation abounds. The question of the sun-Earth connection will not be so pressing if – following Cycle 25 – solar activity returns to normal, as these solar physicists suggest it will. The post Solar Cycle 25: Scientists Rule Out Maunder-Type Solar Minimum appeared first on The Global Warming Policy Forum (GWPF).